Quick Question: Does This Jeep Have Four Wheels, or is it a Three-Wheeler Dually? How many wheels a car has should be an easy question. It’s just counting, right? How hard is that? I bet most people would only need an Associate’s Degree in counting to handle most situations. There are cases where it’s not so clear, though, like in the case of this car, the Willys NC-1a. The Willys NC-1a was a very specialized Jeep variant; it’s basically half a Jeep, with a rebuilt rear half, and designed to start jet engines or carry auxiliary power units (APUs) for aircraft. Since it may be used on aircraft carriers, it needs to be small and nimble. That’s why it has rear-wheel steering and can turn in its own length. And this is what brings us to my question: both these variants technically have four separate wheels. But, is the version with the centrally-mounted tandem wheels really better thought of as a three-wheel car? Specifically, a three-wheel dually? We don’t really think of dually trucks as being six-wheeled vehicles, even though they technically have six wheels, because the rear wheels, while dual, essentially function as a single pair of wider wheels. If that’s the case, should it be any different for this weird Jeep mutant? 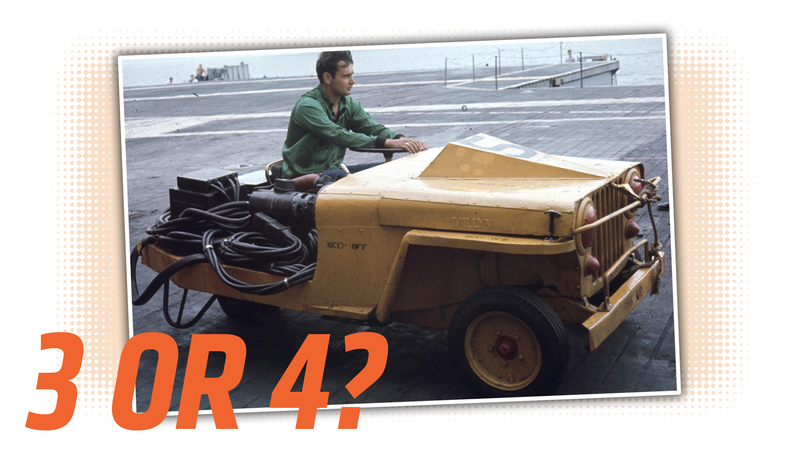 Is it a four-wheeled vehicle, or a three-wheel dually? Consider your answers carefully; I feel like this is important. Quick Question: Would You Wear A Car As Pants? Quick Question: Should There Be More Non-Driving-Related Foot Controls? Quick Question: Have You Ever Used The Headrest While Driving? Quick Question: What Car&apos;s Rear Would Make A Pretty Good Front?